In doing some research for a webinar we were presenting on our parking products, I came across a statistic that really grabbed my attention. It was in a quote from Donald Shoup – a UCLA professor and Parking Expert. Basically he pointed out that the average car in the United States is parked 95 percent of the time! Add to that the fact that – according to the International Energy Agency – there will be 1.7 billion vehicles on the road worldwide by 2035 and it definitely solidifies the need for parking spaces. Just look around you. Parking structures and parking lots are everywhere; municipalities, hospitals and medical facilities, universities, high rise buildings, sporting arenas, office buildings – everywhere. They go by many different names – parking garage, parking deck, parking ramp, parkade, parking building. They come in all different sizes and shapes. Some are new, some are old and some are re-purposed structures that were never meant to be parking facilities. They all have one thing in common – by their very nature they are a breeding ground for accidents. In fact, 20 percent of all motor vehicle accidents occur in parking lots and structures; more cars, more people, increased density, tighter spaces – all increase the possibility of collisions, vehicle damage and structural damage. Think about it. In a perfect world, all parking structures would have enough spaces so that you could find one all the time and the spaces would be wide – wide enough to allow for multiple levels of parking expertise. There would be lights – lots of them and it wouldn’t feel like every car is crammed in like a sardine in a can. Oh and they would be free. Reality check. They’re really cold or really hot depending on the season; they’re usually dimly lit; it seems like there’s never an open space by the elevator or the entrance you are heading to, all the spaces are crammed together, the turns are tight and there are structural columns and walls or poles that are just waiting to be hit. And in many cases, you have to pay for the space. Parking structures have become as much of a necessity as owning a vehicle itself. Dings, dents, fender benders, minor collisions, damage claims, maintenance and other assaults on the facility are a fact of life. Preventive maintenance can’t eliminate all the “hazards” of parking facilities, but it can minimize them. For example, measures like improved lighting enhance visibility and eliminate the dark spots that can lead to damage; clear, highly visible striping can define specific parking spaces and other important areas; and cameras installed throughout the facility supervise activity and promote safety for both pedestrians and drivers. Add to that the installation of impact resistant products. 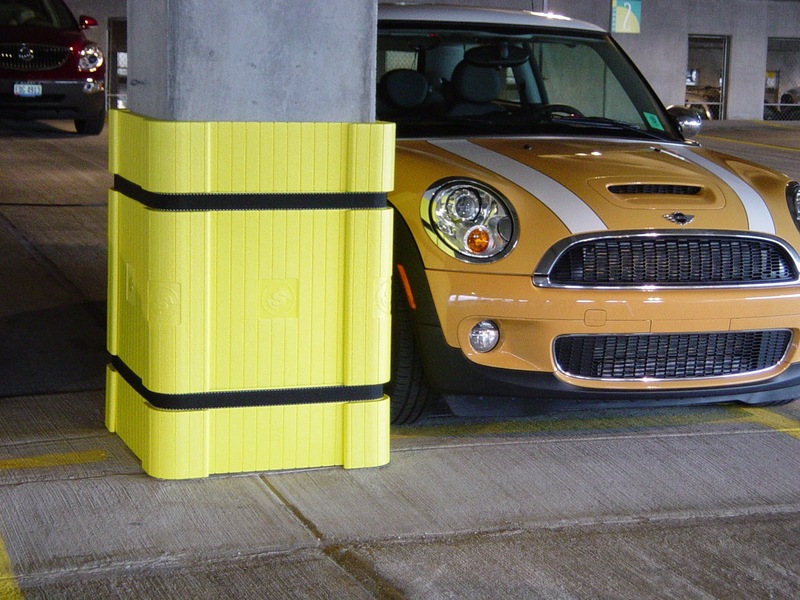 Not only do they protect vehicles from damage, they help prevent structural damage as well. And that’s important – not just for the operators’ benefit but for customers as well. For the operators of the facilities it means less damage, less repairs and less claims. For customers, it creates a nicer experience; one that will keep them coming back. Did you know? According to some sources, the earliest known multi-story car park was built in 1918 for the Hotel La Salle @ 215 West Washington St. in the West Loop area of downtown Chicago, IL.